Early morning flights are never a good idea, but often you have no choice. Such was our experience when we arrived at Gatwick Airport at 5am bleary-eyed. In the departure lounge, we headed for Eat www.eat.co.uk to buy something to take on the plane. Although it was rammed, Ray managed to find a seat. 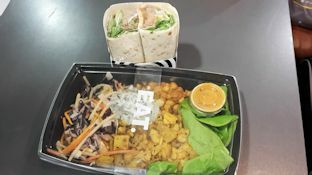 I was surprised to see a wider choice of vegetarian and vegan options than on previous occasions, although there was nothing specifically labelled gluten free or dairy free, but at least all the ingredients are listed so you can see at a glance whether you can eat it. We bought takeaway food and enjoyed a reviving cup of tea with soya milk. Ray opted for his usual at Eat – duck hoi sin wrap (from which he removed the spinach as he can’t eat it.) My choice was the vegan Indian Mezze Salad, delicious. On board the Thomson Airways www.thomson.co.uk flight, we were pleased we had bought food to eat as there is nothing we could have eaten except chips, Proper Corn www.propercorn.com popcorn or Tyrrells crisps www.tyrrellscrisps.co.uk . Other possibilities for Ray, who is dairy free, were the Mediterranean Snack Box, comprising hummus, green pitted olives and crackers, but he couldn’t have had baklava (included in the box) as it contains butter. 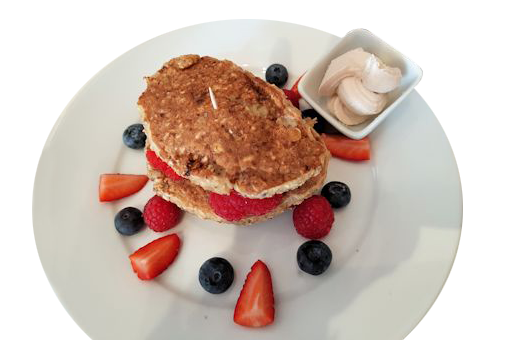 There were no ‘free from’ choices marked on the menu and only two vegetarian offerings – Egg and Slow Roasted Tomato Roll or Mornflake Top Porridge, marked with Vegetarian Society logos. Not much use to us as it doesn’t indicate the presence of gluten or dairy products. We were returning to the Valamar Crystal Hotel www.valamar.com/Porec/Hotel-Crystal in Porec, Croatia – a short distance from Pula Airport. We’d stayed there last April when I was on tour with Elmbridge Ladies Choir www.surreymusic.org and Ray joined me with all the other spouses and other groupies. We liked it so much we returned with Thomson Holidays www.thomson.co.uk (we did look at travelling independently but it was cheaper with a tour operator). On our last visit, the hotel’s ability to cater for our dietary requirements (gluten free and dairy free) was exceptional, so this time we opted for half board (breakfast and dinner). 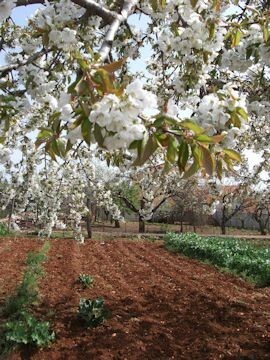 Although Croatia is part of the EU, the currency is “kuna”, about 7 to £1 at the time of writing. What we hadn’t bargained for was the high temperatures – on average it was 32 degrees C – too hot for us, so this is something to bear in mind should you be planning a trip there. The menu at the Pool Bar offered a good choice of food we could both eat; we enjoyed the experience so much that we ate here most days. 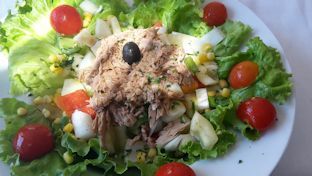 I chose the salads such as Tuna & Vegetable or Caesar Salad (minus the croutons). 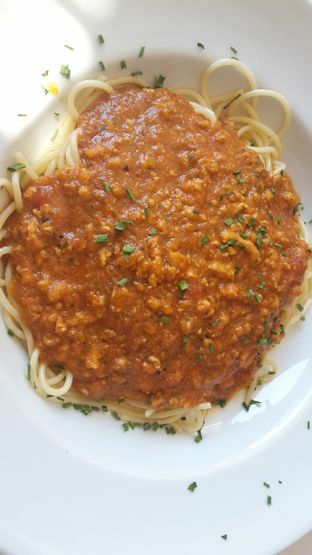 Ray’s favourites were spaghetti Bolognese (no cheese on the top) and grilled chicken fillets and chips. As you can imagine, we were still shell-shocked from our early morning flight, so as soon as the room was ready, we had an afternoon siesta. Dinner was served buffet-style in a vast dining room. As you enter, there was a notice from Pamela PavietiÄ‡, executive chef, asking people with food allergies to consult staff. I have to say the staff went out of their way to accommodate our dietary requirements. Vesna, one of the dining room supervisors, ensured that we were able to find food we could eat. 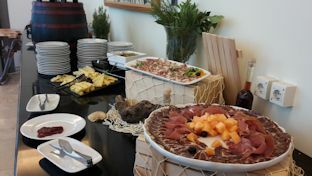 The buffet was vast offering an extensive array of different foods – meat, fish, salads, pasta, pizza, as well as an Istrian corner with local produce such as parma ham and melon. When Ray gave a member of the serving staff his piece of paper, he was served tender beef slices and shown which vegetables he could eat (that didn’t have butter in them). Every night he would ask the staff what he could eat that didn’t contain dairy. They got to know him so well that when he pitched up, they immediately pointed to what he could have. This included roast chicken, turkey, Wiener Schnitzel and crucially they indicated which vegetables and accompaniments didn’t have any butter in them. 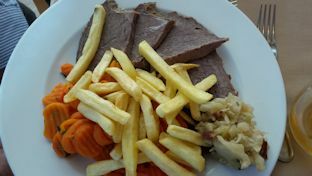 Unfortunately the potatoes usually had butter in them, but not the chips! As I love fish, I always chose the freshly cooked fish on one of the stations. It was a wonderful way of discovering new types of fish I hadn’t tried. 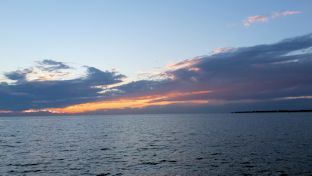 Every night it was something different such as John Dory, trout, grouper, tuna, swordfish, sea bass and sea bream. The fish was always so beautifully tender and tasted more succulent than UK supermarket fish. So I made the most of it. 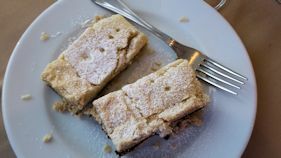 As you would expect, there was a vast selection of cakes – all manner of strudels, cupcakes, eclairs, sponges, cheesecakes and ice cream. 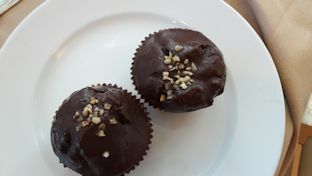 We gazed longingly at them and to our surprise, Pamela, the executive chef came over and asked if we would like soya ice cream, gluten free and dairy free cakes. 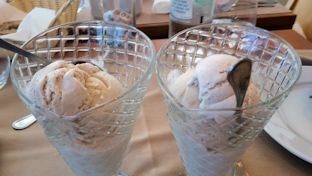 Well I think you can imagine the response “Yes please!” The soya ice cream, served in knickerbocker glory-style glasses, was totally awesome – it was so creamy, it literally melted in your mouth. 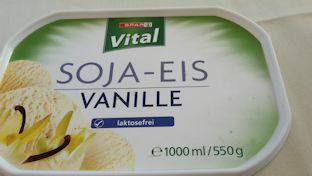 To our astonishment when we asked where it came from, we were shown the lid and it comes from Spar Supermarket. 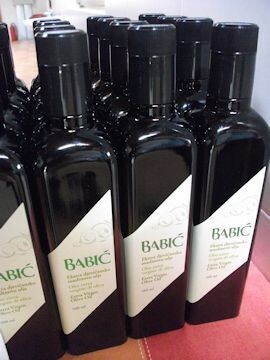 If only UK Spar stores sell it – or maybe they do? I will look into it. 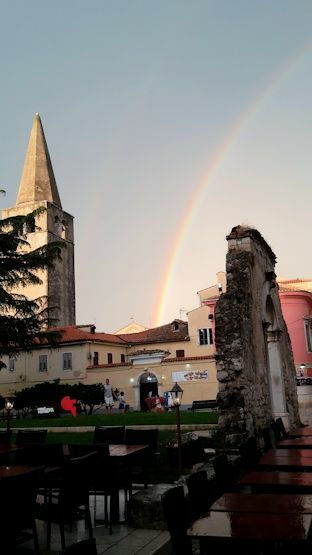 Every evening when the heat dropped we walked into Porec and revisited the places we saw with the choir such as the main square where we sang in the rain. 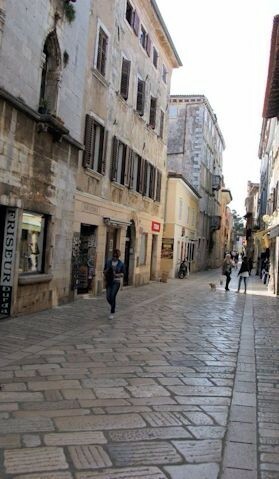 For those who don’t wish to walk, there’s a tourist “noddy” train, a shuttle that transports you from the hotel to Porec town centre. In Porec, the Spar supermarket www.spar.hr has a good selection of “free from” food and this is where we bought Alpro www.alpro.com/uk soya milk. Next door at Müller, http://www.mueller.hr/pocetna-stranica.html there’s also ‘free from’ foods as well as cosmetics, toiletries and toys. 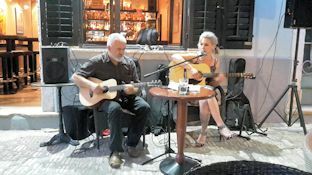 We enjoyed wandering through the Old Town and one evening chanced upon a guitar playing duo singing English jazz songs. Very entertaining. 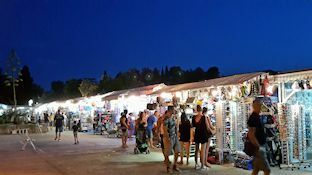 As you first enter the Old Town, there is a wealth of market stalls, all selling similar products as such belts, handbags, sunglasses and so on. 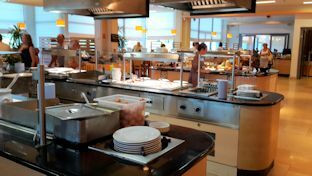 For breakfast at the Valamar Crystal Hotel, another sumptuous buffet was spread out in front of us serving all manner of food such as omelettes, cereals, salads, cold meats, bacon, beans and son on. It was difficult to choose from. 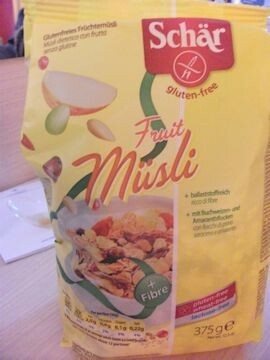 We both started off with Schar gluten free and dairy free muesli, sprinkled with seeds. We noticed later in the week, a whole selection of dairy free milks were on the buffet including rice, soya, almond and lactose free. As we had asked the hotel beforehand, soya milk and gluten free bread was supplied. Vesna checked we had everything we needed. We were touched by their attention, as we’re used to being ignored in many restaurants, left to take pot luck or fend for ourselves. The fresh fruit counter comprised a wide range of fruit – for example, water melon, peaches, pineapple, pears, plums and apples. Ray enjoyed bacons and beans and made an interesting discovery - a vegan dairy free Mediterranean gourmet tuna pate. He chose rye bread from the extensive choice, which he toasted in their machine. 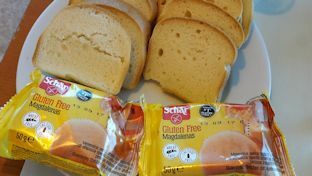 I also toasted the gluten free bread; sheets of paper were available to put either side of the bread to avoid contamination. 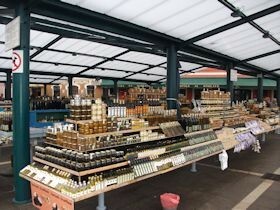 Another highlight was the collection of jams – everything from apple marmalade, sour cherry preserve to mixed fruit. Ray avoided the jams and opted for honey. This was dispensed from an unusual pumping machine we hadn’t seen before. One of the locals was so impressed with our stylish attire, she asked us where we got them and where she should buy them. We believe we’re carrying British haute couture abroad. We sheltered in a café and as we drank our cup of tea, we saw a beautiful rainbow. 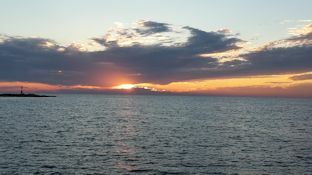 After the rain came some stunning sunsets. Most mornings we would go for a long walk about 6ish before the heat became unbearable. The Valamar Crystal offers a cornucopia of activities – everything from Pilates, dancing, tabletennis, tennis, badminton as well as children’s activities. These include trampolining and a daredevil activity involving a grand trampoline aided by bungee cords that enabled the trampolinist to jump very high indeed. We thought it was rather dangerous, but seemed popular among young children, watched by their mothers. 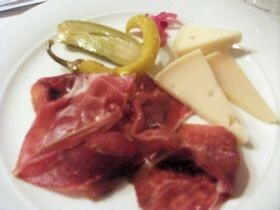 You must be prepared when you travel overseas if you suffer from a food allergy. The best policy is to take food with you in case you have a problem. We always take oatcakes from Nairns www.nairns-oatcakes.com and Nak’d bars www.naturalbalancefoods.co.uk/nakd / both dairy and gluten free. Buying soya milk in containers at airport departure lounges is impossible, so we take some in two 100ml plastic bottles from Muji www.mufi.eu . We find this is enough for the journey and on arrival at our destination until we can find a local supermarket that sells soya milk. I am a member of Elmbridge Ladies Choir so I was travelling to Croatia with them and our sister choir, Elmbridge Mixed Choir, to participate in the Istria Music Festival in Croatia. Spouses, partners and friends were also on the trip so Ray came with me. At Stansted Airport, we were relieved to find Leon Restaurants www.leonrestaurants.co.uk , one of the pioneers of including free from symbols on the menu which is so helpful. Glancing at the blown up menus on display, we could quickly identify which meals we were able to eat. 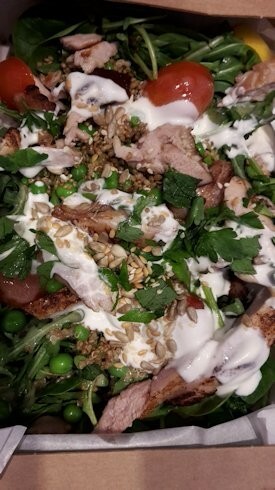 Ray chose Brazilian Black Bean with rice (WF, GF, DF, V, Ve) while I ordered the Chicken Superfood Salad (WF, GF). For dessert I had the cranberry bakewell cake while Ray ordered the dairy free almond and orange cookie. To round off the meal, we also had two teas with soya milk, thus conserving our own supply for as long as possible. 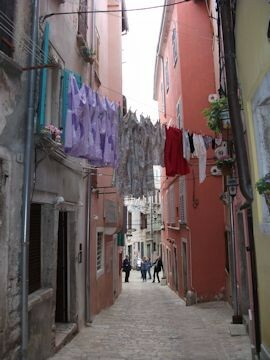 We flew into Pula, then a coach took us to Porec in the Istria peninsula. On arrival at the Valamar Crystal Hotel http://www.valamar.com/en/hotels-porec/valamar-crystal-hotel dinner was available. 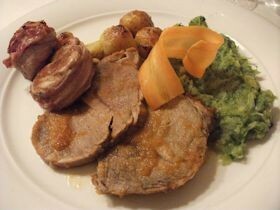 We were astonished by the choice of the dinner buffet, all beautifully displayed. 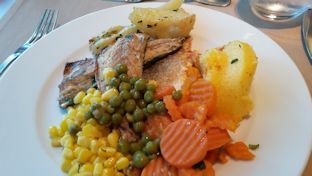 This included a special section where fresh fish was grilled in front of you, a carvery where fresh meat was served, a meat section offering grilled meats, vegetables, desserts, fruits. I don’t think I have ever seen such an extensive buffet. 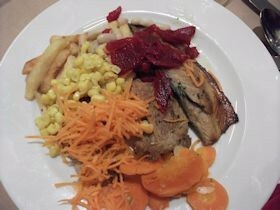 Our group leader had given me a piece of paper“Molim Vas Bez Glutena” (I am gluten intolerant) which I showed the manager, who walked me round the buffet, indicating what I was able to eat. He then did the same with Ray once he had shown him his piece of paper “Ja sam netolerantan na mlijeÄÂne proizvode” saying he was intolerant to dairy products. We both enjoyed a feast of grilled meat and salad – very welcome after a long journey. 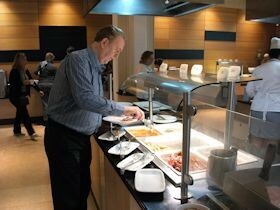 At breakfast, the buffet offered an impressive array of food and again, the manager showed us what we could eat. Gluten free bread was provided which on first glance looked unappetising, but once it was toasted and spread with the blueberry jam, it was delicious. 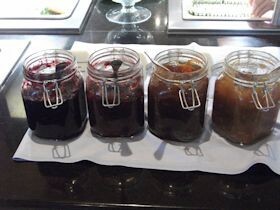 The hotel boasted an amazing array of different jams. Ray had a chat with the manager, who provided us with gluten free and dairy free cereals, suggesting we should keep the packets for the duration of our stay. 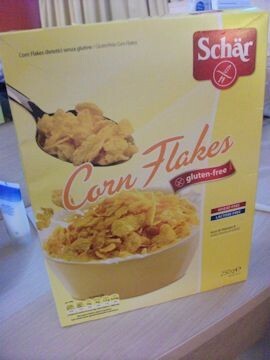 These were Schar’s www.schar.com muesli and cornflakes, which strangely we can’t get in the UK, although other Schar products are available. I must find out why as both these cereals are very tasty and a considerable improvement on most gluten free cereals. Soya milk was freely available, as was rice milk. 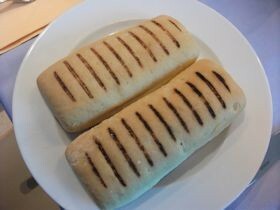 Ray had a choice of rustic-type bread which he spread with honey and crispy bacon. 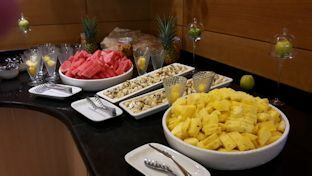 The choice of fruit was wonderful and included fresh pineapple, melon and kiwis, as well as the more usual apples, oranges and bananas. 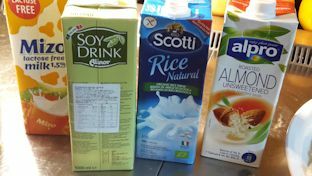 In Porec, we were directed to Billa supermarket www.billa.hr , where we were surprised to find several varieties of soya milk including Alpro in the “health foods” section. 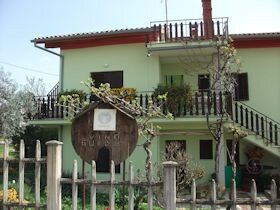 Our group leader had organised a wine and olive tour to artisan producers, which was very interesting. 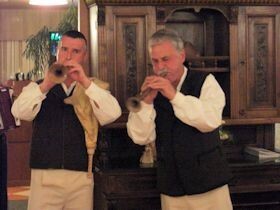 Firstly, our guide took us to the town of Groznjan, which hosts a jazz festival in the summer. We enjoyed a coffee at an outdoor café with arresting views. I was able to buy “Vegeta”, a traditional Croatian condiment with spices and vegetables, although it does contain monosodium glutamate. Apparently it is also available without MSG. 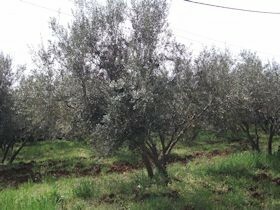 Our guide told us that the Istrian peninsula is a great truffle hunting area in September and October, while goats milk is also produced. 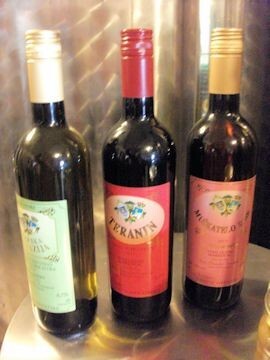 We took part in an olive oil tasting. Ante explained “To taste the oil, warm the small container with the oil in your hands, then drink it back in one.” I followed his instructions and my mouth was infused with a very delicious, spicy olive oil. Next up was a visit to the Bernobic vineyard where we were shown the wine making process by Guido Bernobic and took part in a wine tasting where we tasted Ternani red wine, Malvazles white wine, Muskatelo Rose and an exceptional walnut liqueur (22% alcohol). 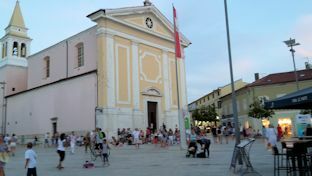 That afternoon we performed in the town square of Porec along with the other choirs from Europe in the rain. All part of the fun. That evening our choirs went to the Trost Restaurant in Vrsar, overlooking the harbour www.restoran-trost.hr, where we had a sumptuous three course dinner – parma ham and cheese (no cheese for Ray), followed by roast pork and vegetables, culminating in a refreshing fruit salad, while we were entertained by local musicians. 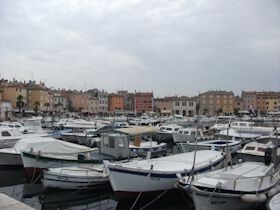 Next day we headed for Rovinj, a Croatian fishing port on the west coast of the Istrian peninsula. 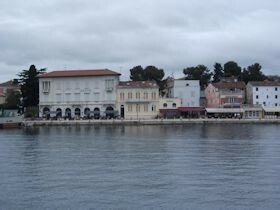 The old town stands on a headland, with houses tightly crowded down to the seafront. 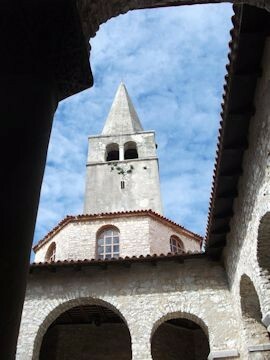 A tangle of cobbled streets leads to the hilltop church of St. Euphemia, whose towering steeple dominates the skyline. 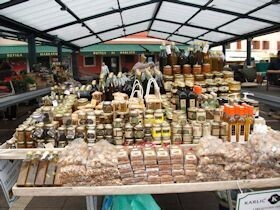 Near the harbour, there’s a market selling food gifts such as olive oil and honey, but be quick to buy, as it closes early. 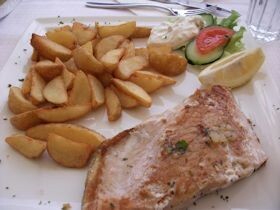 We basked in the sunshine while enjoying lunch at Pogon Bistro www.gg-grupa.eu - grilled salmon with chips. We had shown the waiter our pieces of paper so there was no misunderstanding over our allergies. 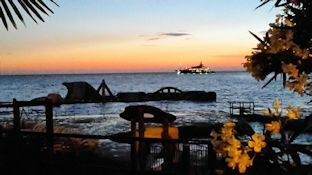 That evening we had dinner at the hotel’s extensive buffet before performing in the 6th Istria Music Festival at Hotel Pical, Porec. Lucky for us we hadn’t been able to get on the flight home on Sunday, so we luxuriated on a free day in Porec with those who remained. 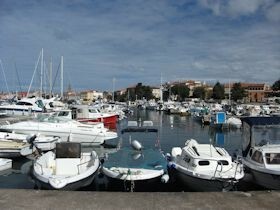 Lunch was at Bijeli San in Porec www.facebook.com/Bijeli-San-501823593253018/?rf=243433722356806 in the sunshine. 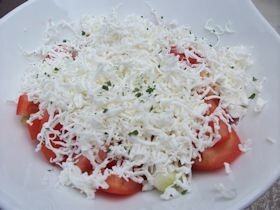 I asked for a feta cheese salad which curiously comprised mainly grated feta cheese with a few tomatoes and cucumber thrown in. 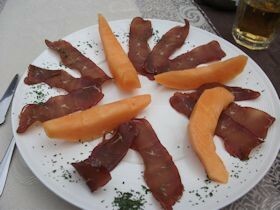 Ray fared better with parma ham and melon. We were only looking for a snack and it was a treat to sit in the sunshine. 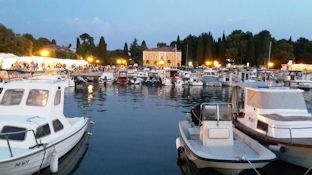 We spent the day wandering round Porec, especially the picturesque harbour before returning to the hotel for dinner by water taxi – a real treat and only £10 (100 kuna) for four of us.